dInstitute of Information Science (P.-L.L. ), Academia Sinica, Taiwan, Republic of China. BACKGROUND AND PURPOSE: The neurologic significance of residual cerebral white matter tracts, identified on diffusion tensor tractography, has not been well studied in tuberous sclerosis complex. We aimed to correlate the quantity of reconstructed white matter tracts with the degree of neurologic impairment of subjects with the use of DTI and determined differences in white matter integrity between patients with tuberous sclerosis complex and controls with the use of voxelwise analysis. MATERIALS AND METHODS: In this case-control study, 16 patients with tuberous sclerosis complex and 12 control subjects underwent DTI. Major white matter tracts, comprising bilateral PF and CF, were reconstructed and assessed for quantity, represented by NOP and NOF. A neurologic severity score, based on the presence of developmental disability, seizure, autism, and other neuropsychiatric disorders, was calculated for each subject. We then correlated this score with white matter quantity. Voxelwise tract-based spatial statistics was used to determine differences in FA, axial, and radial diffusivity values between the tuberous sclerosis complex group and the control subjects. RESULTS: NOP and NOF of CF, bilateral PF, and MWT in the tuberous sclerosis complex group were all significantly lower than those in the control subjects (P < .05). The neurologic severity score was moderately negatively correlated with NOF and NOP regarding CF (r = −.70; r = −.75), bilateral PF (r = −.66; r = −.68), and MWT (r = −.71; r = −.74). Tract-based spatial statistics revealed that patients with tuberous sclerosis complex showed a widespread reduction (P < .05) in FA and axial diffusivity in most cerebral white matter regions. CONCLUSIONS: Patients with tuberous sclerosis complex with reduced residual white matter were neurologically more severely affected. Tract-based spatial statistics revealed decreased FA and axial diffusivity of the cerebral white matter in the tuberous sclerosis complex group, suggesting reduced axonal integrity. DTI has been used to quantify the 3D distribution of water diffusion in tissue8,9 and evaluate the microstructural change of the brain white matter. Diffusion tensor tractography, based on tract orientation information obtained from DTI, is a noninvasive method by which we can create a 3D representation of the white matter tracts10,11 to qualitatively and quantitatively assess the tracts. Previous quantitative DWI and DTI studies of tuberous sclerosis complex largely involved manually counting and measuring individual brain lesions including cortical tubers, transmantle white matter lesions, and subependymal nodules.12,13,16 Because larger tuber volume was correlated with more severe DTI change of white matter tracts,16 studying the white matter therefore may be a reasonable way to assess the load of brain abnormality in tuberous sclerosis complex. However, in many studies measuring diffusion or DTI parameters of specific regions or white matter tracts, technical errors may arise when drawing ROIs to determine the boundaries of specific structures or white matter tracts. Also, in studies that use ROIs, generally only lesions visible on conventional MR imaging are assessed. Furthermore, the neurologic significance of specific white matter tracts in patients with tuberous sclerosis complex is unknown. Assessing whole-brain white matter by means of voxelwise analysis and correlating the quantity of residual major white matter tracts with neurologic severity of patients may be more clinically feasible and relevant approaches in evaluating patients with tuberous sclerosis complex. Tract-based spatial statistics, a recently developed voxelwise statistical analytical method for DTI data, is an automatic and operator-independent method with a specific registration algorithm.17 It needs no data smoothing, which minimizes misregistration. Tract-based spatial statistics has been used to identify microstructural white matter abnormalities in many diseases.18⇓⇓–21 Because of its ability to analyze the whole brain, tract-based spatial statistics may be valuable for assessing diseases with diffuse brain lesions, such as tuberous sclerosis complex. With the use of diffusion tensor tractography to reconstruct brain white matter tracts, we aimed to correlate the quantity of reconstructed white matter tracts with the degree of neurologic impairment of subjects. We also aimed to determine any differences in white matter integrity between patients with tuberous sclerosis complex and control subjects by means of voxelwise analysis. We hypothesized that children with tuberous sclerosis complex have fewer reconstructed major white matter tracts than do control subjects and that this would negatively correlate with neurologic severity. Second, we hypothesized that there is a difference in DTI metrics between the 2 groups. During a 2-year-period, we prospectively recruited 32 subjects for DTI and diffusion tensor tractography, including 20 consecutive subjects with a clinical diagnosis of tuberous sclerosis complex. The study groups, after the exclusion of 4 patients (ages 0–3 years), consisted of 16 patients (7 male and 9 female; ages 5–29 years; mean ± SD age, 13 ± 6.48 years) and 12 control subjects (7 male and 5 female; ages 4–34 years; mean ± SD age, 15.33 ± 8.26 years) with a normal conventional MR imaging. Patients did not differ from control subjects on age distribution (t test, P > .4). Our institutional review board approved the study, and informed consent was obtained from the subjects. Diagnosis of tuberous sclerosis complex was made by an experienced pediatric neurologist (H.-S.W. ), and all patients met established revised diagnostic criteria for tuberous sclerosis complex.22 Subjects were excluded if they were <4 years of age or had <2 years of follow-up history and incomplete clinical information. Individuals eligible for selection as control subjects were prospectively recruited during the reading sessions of a particular neuroradiologist (A.M.W.). All control subjects had unremarkable conventional MR imaging findings and no developmental abnormality, neuropsychiatric disorders, or motor deficits. The indications for clinical MR imaging of the control subjects included headaches, vertigo, suspected sellar mass, suspected intracranial vascular lesions, or suspected arachnoid cyst. A pediatric neurologist (H.-S.W. ), a clinical professor with 30 years of experience in pediatric neurology, who was blinded to MR findings, assessed the neurologic severity of the patients at the time of diffusion tensor tractography by clinical examination and reviewing medical records, if necessary. A severity score was devised to quantify the severity of each subject.5,23 According to criteria in the Diagnostic and Statistical Manual of Mental Disorders, 4th edition, the components of neurologic severity assessed included: developmental disability, seizures (controlled or intractable), autism, and other neuropsychiatric disorders (including self-injury, violent behavior, learning disorder, language difficulties, and anger outbursts). Developmental disability was assigned 3 points. Intractable seizure and autism were assigned 2 points each. The “other neuropsychiatric disorders” component, regardless of how many disorders a patient had, and controlled seizure, were assigned 1 point each. Intractable seizure was defined as failure of seizure control after using ≥2 first-line antiepileptic medications, 1 seizure per month for 18 months, or freedom from seizures for fewer than 3 consecutive months. The neurologic severity score of each subject was calculated by totaling the points of the components. MR imaging was performed with a 1.5T unit (Intera; Philips Medical Systems, Best, The Netherlands) with a slew rate of 150 T/m/s. Conventional MR imaging included coronal T2-weighted FSE and FLAIR sequences, axial T1-weighted spin-echo and FLAIR sequences, and a sagittal T2-weighted FSE sequence. DTI was performed with a 6-channel sensitivity encoding head coil operating in the receive mode by use of a single-shot EPI sequence, with TR = 5188 ms, TE = 78 ms, b-values = 0, 1000 seconds/mm2, acquisition matrix = 128 × 128, number of sections = 55, section thickness = 3 mm, and number of gradient directions = 16. The gradient strength was 19.5 mT/m for b = 1000 seconds/mm2 with diffusion times Δ of 43.8 ms and δ of 26 ms. The DTI sequence was repeated 4 times with 1 signal acquired and with a total image acquisition time of 7 minutes. DTI data were transferred to an off-line computer equipped with an automated image registration software (Diffusion Registration Tool, release 0.4; Phillips Medical Systems, and IDL; ITT, Boulder, Colorado) to correct for eddy current and motion-related misalignment. Diffusion-weighted images, ADC, and FA maps were generated by use of Philips Research Imaging Development Environment software provided by the manufacturer. FA was calculated from the eigenvalues that were obtained by diagonalizing diffusion tensors at each voxel.8,24 Fiber tracking was performed with the use of the software, which used a line propagation technique with the assumption of the principal eigenvector indicating the orientation of axons in each voxel. Tracking was started from a seed ROI from which a line was propagated in both forward and backward directions from voxel to voxel, according to the principal eigenvector at each voxel.10 Tracking was terminated when it reached a pixel with low fractional anisotropy (FA < 0.25) and/or a predetermined trajectory curvature between 2 consecutive vectors (turning angle >30°). A lower turning angle was used in tracking termination to decrease false-positive fiber tracts and computational load.25 To reconstruct PF on 1 side, 1 investigator (A.M.W. ), who is a neuroradiologist having 1 year of fellowship training in pediatric neuroradiology, 9 years of experience in practicing pediatric neuroradiology, and 5 years of experience in DTI, manually drew an ROI on an axial b = 0 section to include the ipsilateral head of the caudate nucleus, internal capsule, lentiform nucleus, external capsule, and thalamus (Fig 1A) and another ROI over the brain stem. CF within the corpus callosum were generated by placing a 2D ROI to include the corpus callosum, which was identified on the sagittal section nearest to the midline (Fig 1B). As a result, the major white matter tracts of each subject were reconstructed in 3 sessions: 2 yielding the PF and 1 yielding the CF. Quantitative results of the generated fibers, including the right and left PF, CF, and the summation of these tracts (MWT), were automatically obtained by the software,26 initiated by right-clicking with the mouse on the fibers. The results include the FA, NOP, and NOF. NOP was an arbitrary unit proportional to the volume of the generated tracts in a single reconstruction, and NOF was the number of tracts generated in that reconstruction. Regions of interest (green shaded areas) were manually drawn on axial B0 image (A) to include the ipsilateral caudate head, internal capsule, lentiform nucleus, external capsule, and thalamus for reconstructing the PF on one side, and on sagittal B0 image (B) to include the corpus callosum for reconstructing the CF. Voxelwise statistical analysis of the DTI data was performed by using tract-based spatial statistics17 implemented in the Functional MR Imaging of the Brain Software Library toolbox (Version 4.1.6, http://fsl.fmrib.ox.ac.uk/fsl/fslwiki/FslInstallation).27 The raw DTI data were corrected for motion and eddy current effects. FA images were then created by fitting a tensor model to the data by using the Diffusion Toolbox, and automatic brain extraction was performed by using the Brain Extraction Tool.28 For spatial normalization, all subjects' FA data were then aligned into a common space by using the Nonlinear Registration Tool. Among the 3 options for nonlinear registration (by use of predefined target image, automatically chosen target, and most representative target), we chose the “most representative” option for the registration such that every FA image was aligned to every other one to identify the most representative image as the target image.17 This option was recommended for generating a study-specific target, particularly in a study containing mostly children. The target image was then affine-aligned into Montreal Neurological Institute 152 space, and every image was transformed into 1 × 1 × 1 mm Montreal Neurological Institute 152 space by combining the nonlinear transform to the target FA image with the affine transform from the target native space to Montreal Neurological Institute 152 space. The mean FA image of all subjects was created and thinned to create the mean FA skeleton, which represented the centers of all tracts common to all subjects. This skeleton was thresholded at FA > 0.2. The aligned FA data of each subject were then projected onto this skeleton for voxelwise cross-subject statistics. Tract-based spatial statistics analysis was also applied to maps of axial diffusivity and radial diffusivity. Independent t tests were used to compare each of the results of fiber tracking (FA, NOP, and NOF) of the PF (left PF, right PF, bilateral PF) and CF between the patient group and the control group. Results of the MWT, calculated by summation of results of the bilateral PF and CF regarding NOP and NOF, and by weighted averaging of results of these tracts regarding FA, were also compared between the patient group and the control group. Pearson correlation tests were used to calculate the strength of association between the neurologic severity score and the results of fiber tracking in all subjects. Voxelwise comparisons of FA, axial diffusivity, and radial diffusivity between groups were performed with the recommended Randomize Tool in the Functional MR Imaging of the Brain Software Library toolbox by use of nonparametric t tests. The data were analyzed by use of permutation-based inference (5000 permutations) and threshold-free cluster enhancement. The results were corrected for multiple comparisons by controlling the family-wise error rate. A result with P < .05 was considered statistically significant. Of the 16 subjects, 13 had controlled seizures, 2 had intractable seizures, 9 had developmental disability, and 4 had autism (Table 1). Ten subjects had neuropsychiatric disorders including self-injury, violent behavior, learning disorder, language difficulties, or anger outbursts. NOP and NOF of CF, left PF, right PF, bilateral PF, and MWT in the tuberous sclerosis complex group were all significantly smaller than those in the control group (P < .05) (Table 2). No significant difference in FA between the tuberous sclerosis complex group and the control group was found in CF, left PF, right PF, bilateral PF, and MWT (P > .05). The neurologic severity score was moderately negatively correlated with NOF and NOP regarding CF, left PF, right PF, bilateral PF, and MWT (Fig 2) (Table 3). Scatterplots show moderate negative correlation between the neurologic severity score and NOF (A) and NOP (B) in the patients with tuberous sclerosis complex and control subjects. Axial diffusivity of the tuberous sclerosis complex group was lower than that of the control group in all cerebral white matter regions including the corpus callosum, the internal capsules, the external capsules, bilateral frontal, parietal, temporal, and occipital white matter regions (P < .05). FA was lower in the tuberous sclerosis complex group in all cerebral white matter regions (P < .05) except the bilateral occipital regions, right temporal and parietal regions, and the corpus callosum (Fig 3). We did not find areas in which FA was lower in the control group. No statistically significant difference in radial diffusivity between the tuberous sclerosis complex and the control groups was found. Results of tract-based spatial statistics analysis revealed significant differences between the tuberous sclerosis complex and control groups in FA (A) and axial diffusivity (B) maps, with overlaid mean value skeleton. Regions of the skeleton in green represent areas of no significant differences in values between the tuberous sclerosis complex group and the control subjects. Regions in blue are areas in which the value was significantly lower in the tuberous sclerosis complex group. Our results showed that the NOP and NOF of MWT in the tuberous sclerosis complex group were significantly smaller than those of the control subjects. NOP was proportional to the volume of the generated tracts; NOF was concerned with the number but not the length of the tracts. 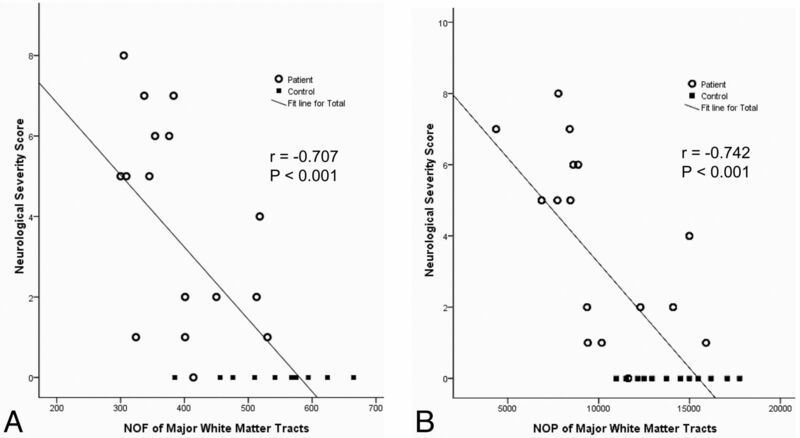 The lack of statistical difference of FA of MWT between the tuberous sclerosis complex group (95% CI, 0.463–0.478) and the control subjects (95% CI, 0.463–0.483) suggested that the reconstructed white matter tracts in the tuberous sclerosis complex subjects were predominantly normal white matter tracts. Our results therefore implied that patients with tuberous sclerosis complex, when compared with control subjects, had a reduced quantity of residual normal white matter tracts and a widespread decrease in cerebral white matter integrity. Pathologically, atypical cells including balloon cells, giant neurons, and areas of hypomyelination are present in the white matter of patients with tuberous sclerosis complex.29 The presence of these abnormal cells within the WM region, probably a result of faulty neuronal migration and differentiation, may be associated with decreased WM integrity. 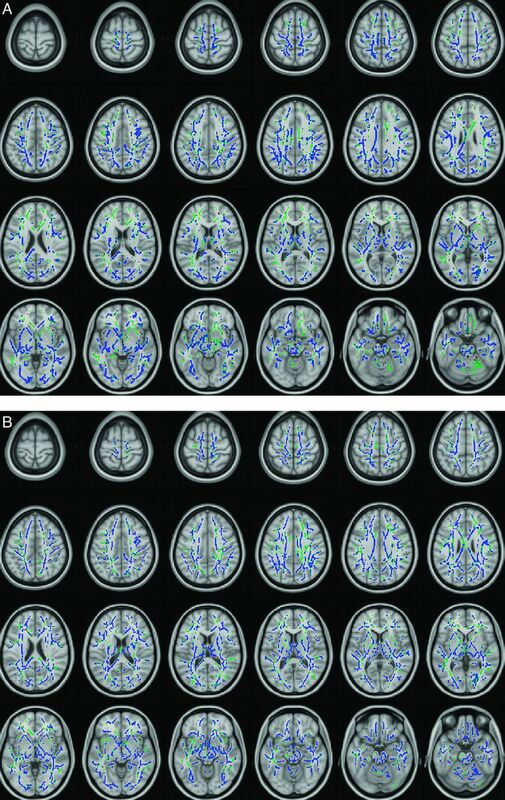 Decreased FA and increased diffusivity have been reported in both white matter lesions12,13 and normal-appearing white matter14 in patients with tuberous sclerosis complex. Our results also showed a moderate negative correlation between the neurologic severity score and both NOP and NOF in the CF and PF, suggesting that patients with decreased quantity of residual white matter tracts in these regions were neurologically more severely affected. Through the use of diffusion tensor tractography, several studies have revealed reduction of white matter tracts in developmental delay30 and autism31 as well as decreased FA in specific white matter networks in temporal lobe epilepsy32; these neurologic features were major components of the neurologic severity score in our study. We therefore demonstrated a possibility of correlating the neurologic status of patients with tuberous sclerosis complex with the quantity of residual major white matter tracts (CF and bilateral PF) by use of a relatively time-saving region of an interest–based tractography method, instead of assessing individual tuberous sclerosis complex lesions. Similar results of reduction of NOF and NOP were obtained in patients with tuberous sclerosis complex. If the patients and the control subjects had a similar number of fibers but the patients had shorter fibers, the patients would have NOF similar to that in the control subjects but smaller NOP. Furthermore, if the patients had fewer but longer fibers, they would have a lower NOF but probably an NOP similar to that in control subjects. Therefore, the decrease in both NOF and NOP in the tuberous sclerosis complex group suggested that the patients might have fewer fibers with shorter or similar length. Voxelwise tract-based spatial statistics analysis revealed decreased FA and decreased axial diffusivity in the tuberous sclerosis complex group. 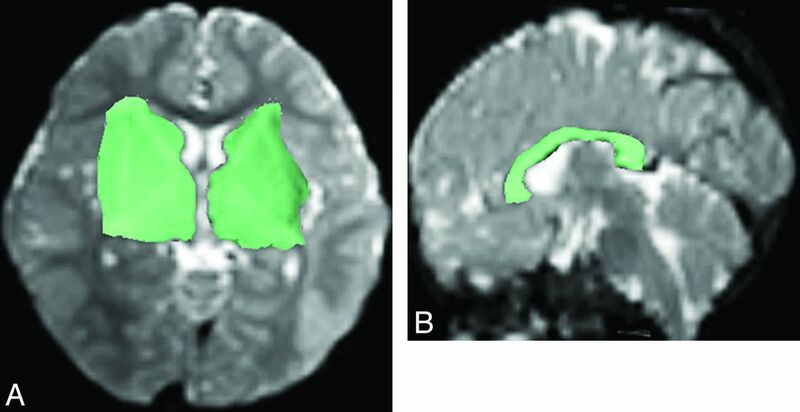 A decrease in FA may be attributed to disorganized axons and hypomyelination.33,34 Previous DTI studies of tuberous sclerosis complex also revealed a reduction of FA in the white matter lesions12,13 and normal-appearing white matter.14 The lower axial diffusivity in the tuberous sclerosis complex group suggested poor integrity of axons.35,36 Moreover, because FA is known to positively correlate with axial diffusivity,37 our result of a decrease in both FA and axial diffusivity was reasonable. We did not find a statistical difference of radial diffusivity between the tuberous sclerosis complex group and the control subjects. Although increased radial diffusivity was reported in a recent tractography study,35 this finding was only found in the callosal splenium but not in most of the white matter regions in that study. Considering the findings reported by Krishnan et al35 and our findings, change in radial diffusivity may not be a predominant feature of the measured DTI metrics or the change was too small to cause a statistically significant difference. We did not specifically reconstruct the association fibers because a portion of the association fibers was reconstructed in each of the trackings of the PF and the CF. Thus, the volume of the remaining association fibers was relatively insignificant when compared with the white matter of the entire brain. Moreover, multiple ROIs would have been used to select the diffusely distributed association fibers, and this probably would result in technical errors that would reduce the accuracy and reproducibility of the study. Like other studies of diffusion tensor tractography, our study used a method to reconstruct fibers dependent on directional consistency computation, which has been a limitation common to current fiber-tracking methods.38 However, we chose to study the CF and the PF that were less likely to have highly curved turns susceptible to this computation limitation. The range of age of our patients was wide (4–30 years). Myelination is active in early childhood and may affect the quantity of generated tracts computed by diffusion tensor tractography. However, in our study, subjects younger than 4 years of age, in whom myelination would be still active, were excluded. Moreover, we recruited control subjects who did not significantly differ from the patients with tuberous sclerosis complex on age distribution. Because the relative significance of each feature was unknown, it would have been ideal to correlate the DTI and tractography results with individual neurologic features rather than by use of a composite score; however, this would lead to fewer samples in each group with a single feature. Early behavioral intervention may be beneficial to children with tuberous sclerosis complex,39 particularly during the period of brain plasticity. Newer therapeutic agents, such as rapamycin, have been reported to prevent epilepsy and to reverse mental retardation and learning problems in mouse models of tuberous sclerosis complex.40,41 Subgroup analysis of a recent phase I/II trial of everolimus, a mammalian target of rapamycin inhibitor, demonstrated increased FA and decreased radial diffusivity in the normal-appearing white matter of the treated subjects.42 Objectively assessing the cerebral white matter quantity and comparing diffusion tensor metrics between patient groups, diffusion tensor tractography may be a clinically practical neuroimaging technique to evaluate treatment efficacy. Patients with tuberous sclerosis complex with reduced residual cerebral white matter were neurologically more severely affected. Voxelwise tract-based spatial statistics analysis revealed decreased FA and decreased axial diffusivity of the cerebral white matter in the tuberous sclerosis complex group, suggesting reduced axonal integrity. Diffusion tensor tractography may be a clinically applicable neuroimaging approach to assess the tuberous sclerosis complex brain abnormalities in a global way. Disclosures: Alex Wong—RELATED: Grant: National Science Council (Taiwan). This work was supported by the National Science Council of Taiwan (Grant No. NSC 94-2314-B-182A-113). Accepted after revision December 17, 2012.